MIAMI, FL--(Marketwire - Nov 1, 2012) - PODER Hispanic magazine, the premier business and lifestyle publication for Latino and Hispanic leaders, is proud to announce that the fourth and final stop in the EMERGE business networking series for the year is in Miami on November 8th at the EPIC Hotel. EMERGE provides participants with an educational experience in support of its ongoing commitment to empower and spark the professional development of young emerging Latinos. Celebrating its fifth year, the national EMERGE Series, a unique experience for young Hispanic emerging professionals, has already made stops in San Antonio, Charlotte and Chicago earlier this year. The dynamic panel will be moderated by Emmy-nominated CBS4 weekend morning news anchor Marybel Rodriguez. Event Sponsors include State Farm, Prudential, Yum! Brands and is supported by LATISM, Las Comadres, NCLR, WebCityGirls, Latina Smart, latinbiz, and Marketwire as the official newswire sponsor. Thursday, November 8, 2012 from 6 p.m. to 10 p.m. Registration will start at 6:00 p.m. followed by a panel discussion from 7:00-8:00 p.m. and a cocktail networking reception from 8:00-10:00 p.m. Guests are invited to join us for complimentary drinks and appetizers as part of the networking experience. Attendees will also receive discounted valet parking. Top executives of PODER Hispanic magazine and Televisa Publishing + Digital and over 200 emerging Hispanic professionals, corporate CEOs, civic leaders, Hispanic media and entertainers. 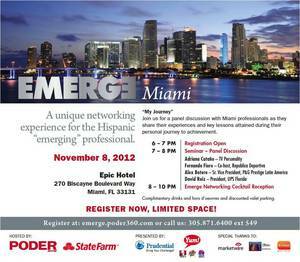 EMERGE is a national Hispanic networking series for emerging young professionals. The event is hosted by PODER Hispanic magazine and published by Televisa Publishing + Digital, a division of Grupo Televisa, the largest Spanish-language media company in the world.